In sewing, mistakes are inevitable. Perhaps you accidentally clip a seam allowance and the seam, or you decide to skip interfacing this one time. Some overzealous scissor wielding or a too hot iron and a whole project can be ruined in seconds. Kittens, I've been there. Personally, my most regrettable mistakes all involve fabric. Whether choosing a knit with too little stretch or blindly ignoring something's polyester content, I've done it all. The worst, however, are the projects which paired beautiful lengths of fabric with mediocre, ill-fitting patterns. 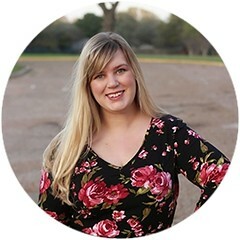 Most of those were before this blog started, but there have been some doozies even in the last six years! The one I look back on with genuine sadness is actually my very first shirtdress, the Sally Shirtdress from 2014. Despite that post's optimistic ending, it did not get a ton of wear. I wore the dress twice more, before consigning it to the back my closet forever. Both times, I couldn't wait to get back home and take the damn thing off. The buttons pulled constantly and the fabric bunched in odd places. 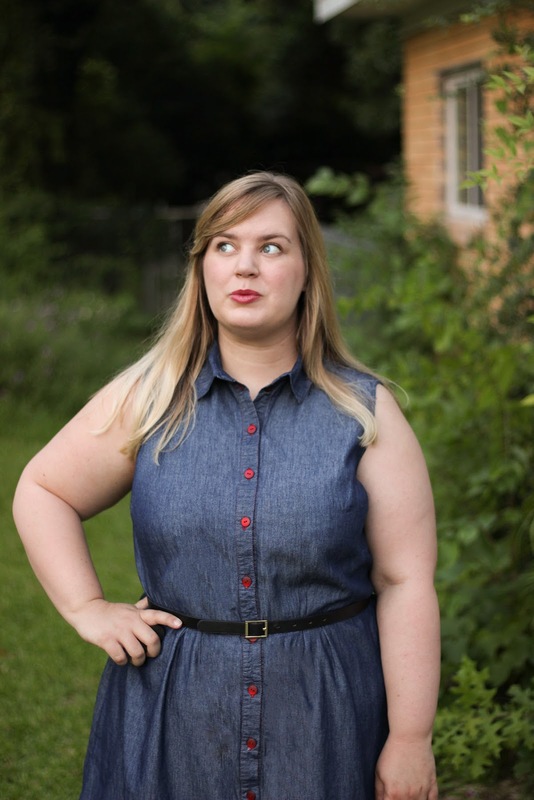 Despite the luxe chambray and beautiful vintage buttons, it was a total disaster to wear. The pattern didn't work for me, simple enough. And yet, I still loved the style. 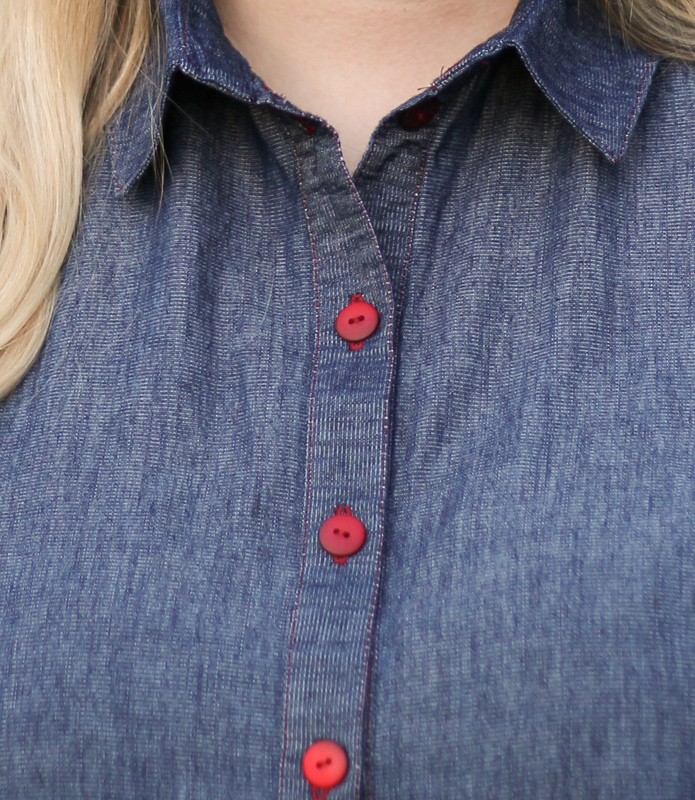 Dark blue chambray and red buttons are such a classic American combination. 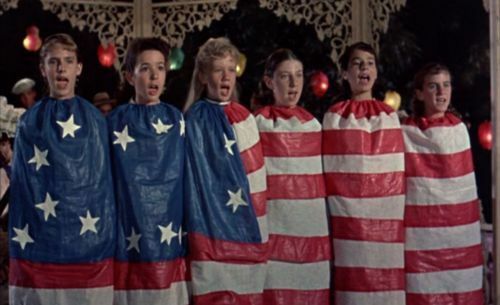 There's no garment more appropriate for a summer BBQ or 4th of July parade, unless you actually swath yourself in star spangled banners a la Pollyanna. Pollyanna: Taking cheerfulness and a theme too far, since 1913. 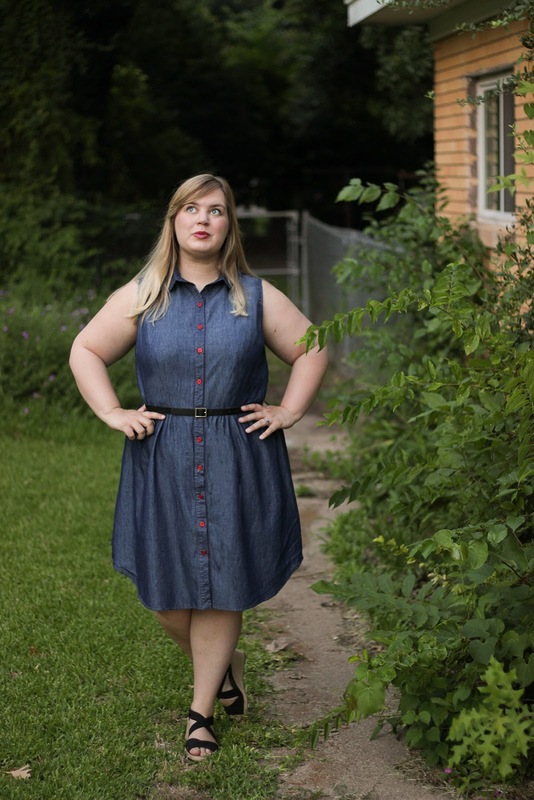 While the patriotic body bag was a tempting look, instead I decided to have another go at that chambray dress. This time, I armed myself with a better pattern and two more years of pattern fitting experience. Even the fabric got a little nicer, with this dishy Rag & Bone indigo cotton chambray from Mood. Thanks to a plain weave and strategic thread patterns, the fabric looks like a true denim, but has the lightweight feel of a drapey shirting. There's also a soft iridescence to its face, which changes the blue in different angles. For the pattern, I opted for my new go-to shirtdress pattern, which you've all heard about to death. This is McCall's 7351 (surprise!) with my altered narrow silhouette, which added waist darts and hip ease to View A. This is actually one of those dresses from my furious batch sewing binge, back in May. The other two didn't photograph as well, after a month of wearing and washing, so will have to make their debuts on Instagram at some point. Why, yes, I am dying to snip those errant little threads on the collar. While I wanted to use the vintage embossed buttons from my original Sally Shirtdress, fate had other plans. In my manic closet cleaning, this spring, that dress accidentally ended up in a charity pile instead of the refashion box. 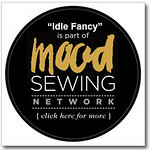 Somewhere, I hope someone is greatly enjoying those gorgeous buttons! This dress had to settle with plain red plastic buttons from JoAnn Fabrics. Their color pops off the dark chambray beautifully and matched some stashed thread, so it all worked out rather well. The construction details of this dress are exactly the same as my previous versions, down to top-stitching all the things and self-fabric finishes. However, if you squint at the picture above you can see a special little change. All the top-stitching thread is red! It's more apparent in real life than in pictures, but I adore it. Coordinated stitching is something that I love in ready-to-wear designs, yet rarely do myself. There's too much room for error, when every stitch is that obvious. This dress seemed worth it, though, and the extra time for perfectionism paid off. The collar and button bands look gorgeous. And that, my dears, is victory. The dreadful mistake is finally undone! I love this dress. It feels wonderful to own a version of this style that I will actually wear. There's no unsightly bunching or pulling, here. 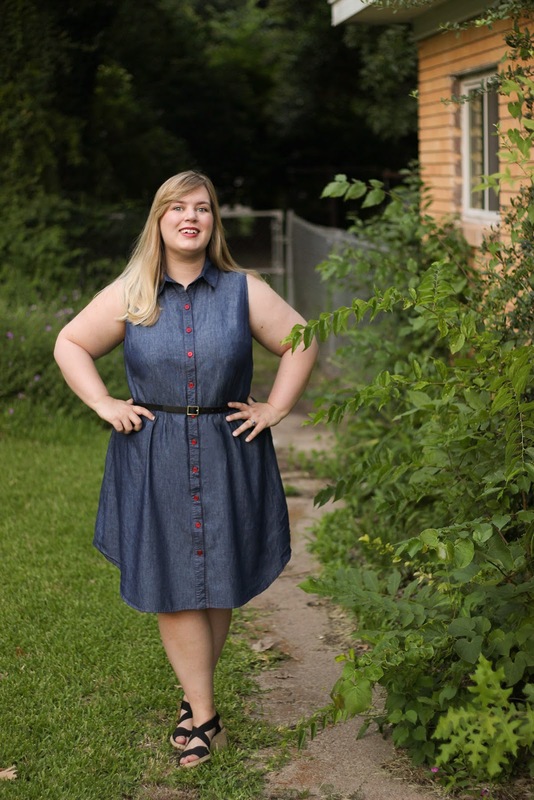 It's all perfectly fitting, perfectly comfortable chambray goodness. Let's be honest, much like shirtdresses, I'll probably just make them all.